Inspired by the true story of a little girl in Afghanistan who attended the school at which author Eddie Ayres taught, this beautifully illustrated story is one of hope, resilience and the special power of music. It will connect children with others who live in very different places and emphasises what we all have in common. Sonam is seven years old and growing up in Kabul. Even at this young age, she has a job selling chewing gum to people in their cars. To distract her from the frightening sounds of the traffic and – even more threatening – distant gunfire, she hums to herself, music she has learned from an old man who presents her with a rubab, a lute like instrument much-loved by Afghans. 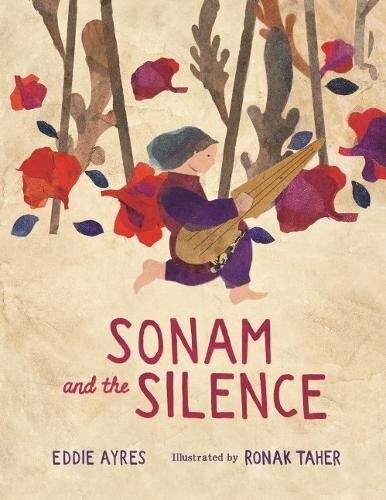 When her brother finds the instrument, he takes it away and life gets even more frightening as war rages around Sonam and foreign soldiers arrive. Visiting her friend’s garden again, Sonam finds the rubab hidden for her by her brother, and takes pomegranate seeds to grow her own trees. In the quiet of the garden, the music returns and Sonam realises it is in her heart. We know that as the seeds grow, the music will return too. Ronak Taher’s illustrations are striking – mixed media collages that use colour and startling compositions to create mood and a sense of the unfolding story: quiet browns and sand colours represent Sonam’s home life, bright greens, turquoises and bold reds depict the old man’s garden and the colours of the rubab’s music. Stark cut outs of shouting soldiers in black and ochre vividly evoke the terrors of war. The final page returns to the pinks, ruby reds and purples of the garden to leave readers with a sense of peace and hope for Sonam and for us all.